Hi I’m Pat Sloan, the Aurifil Designer of the Month coordinator. 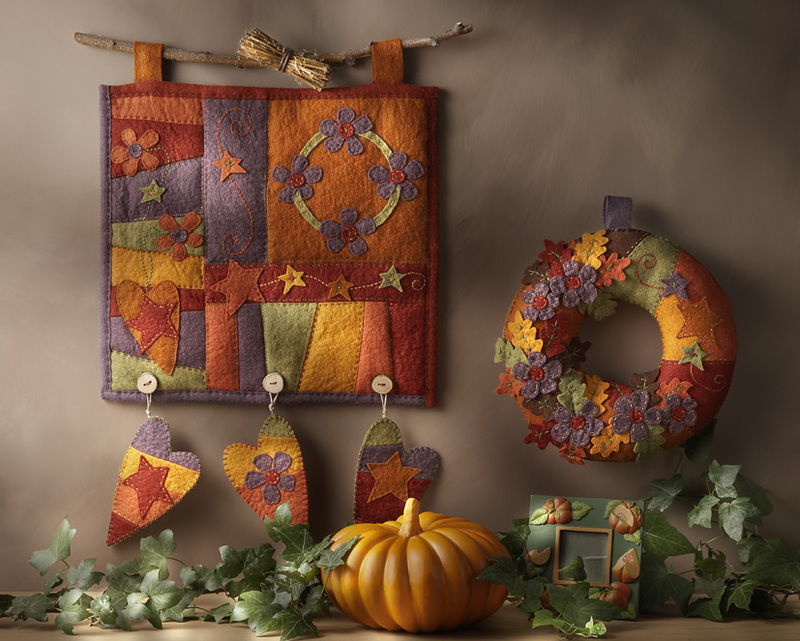 I’d like to introduce you to our October Aurifil Designer, the Super talented stitcher Marianne Byrne-Goarin! Marianne and I have been friends for years, meeting on the internet in a 3D community, how cool is that! 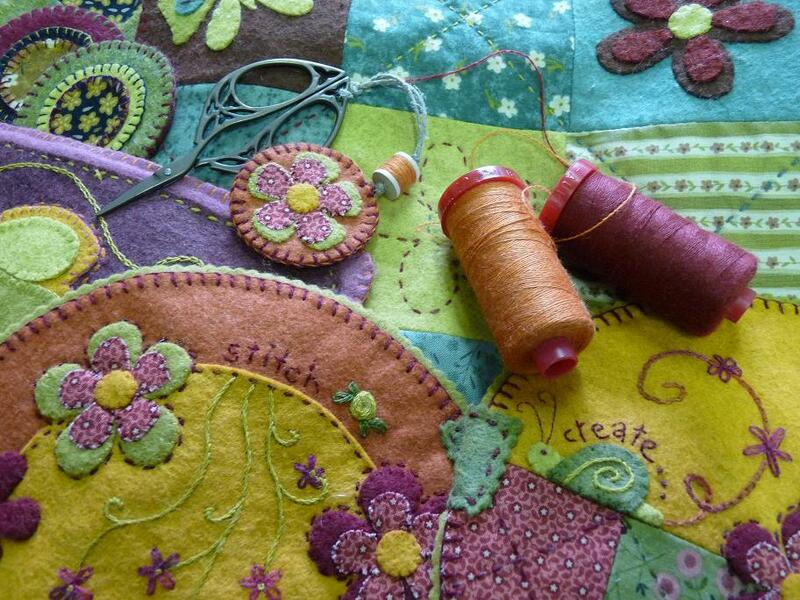 (Second life) She does the most amazing projects with wool and Aurifil’s lana wool thread. 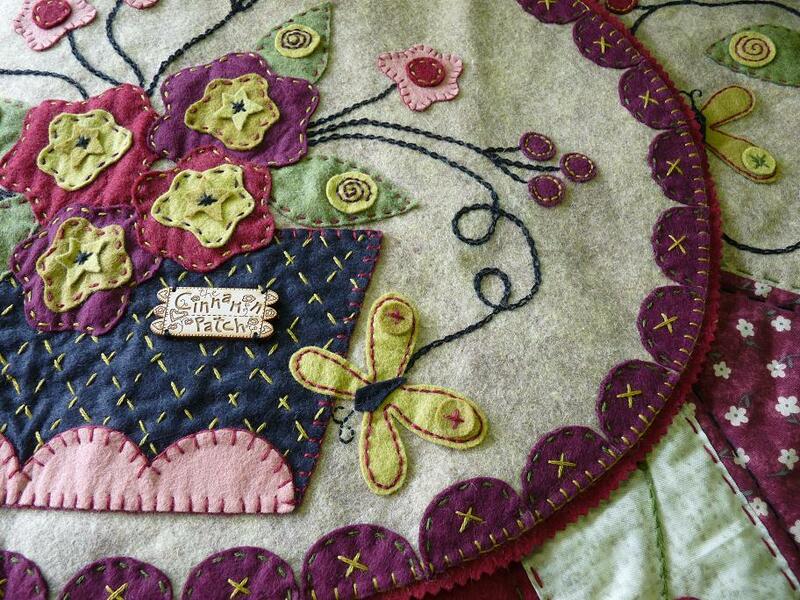 Her wall hanging she designed for you is so adorable you will want to make it right away. Marianne is Irish and has lived in France most of her adult life.. she is more than delightful and you are in for a real treat… so Let’s go meet her! 1. When was your FIRST quilt sighting? Did it inspire you to start quilting? My very first quilt was a huge Sunshine and Shadow bed quilt which I bought in a “going out of business” sale. I loved the palette of dusty pastels… pinks, blues, yellows and greens. When I discovered that it was way too big for my bed I had a brainwave and proceeded to cut off the 4 corners of the quilt which I then reassembled into a square. I then hung the reassembled square quilt on the wall behind my bed and used the remaining square to decorate my bed. And I was delighted with myself! When I think about it, this first “quilting experience” still fits with my approach to quilting today. I am definitely a « bits and pieces” quilter. I never learned the basics and generally do not follow the rules for good cutting and assembly. Thank goodness for wool and woolfelt. They are very forgiving materials for an unruly and undisciplined quilter like myself! 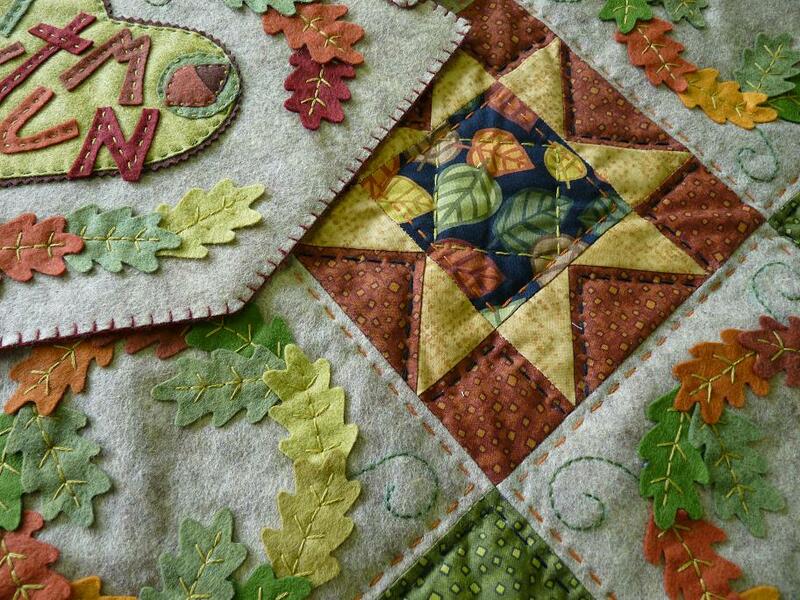 I love any quilt that has appliqué on it. 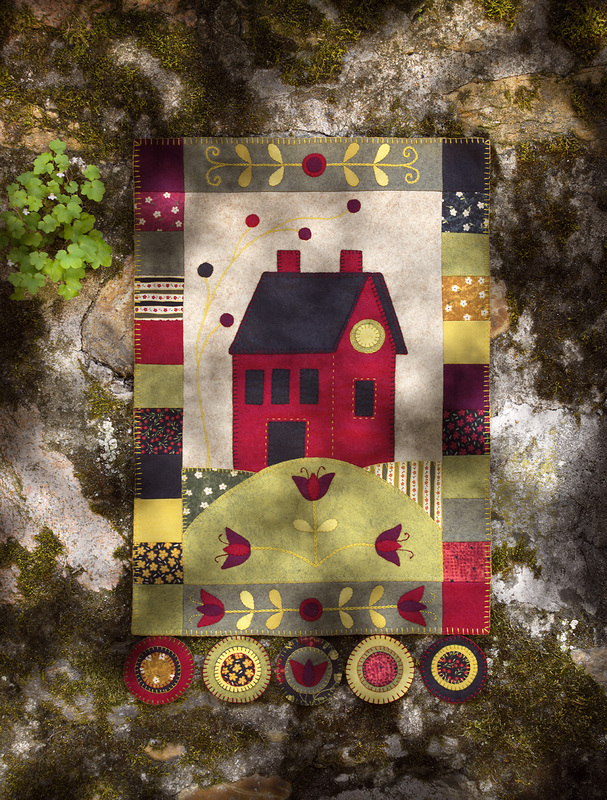 A few years ago I discovered “penny rugs” and fell in love with the simple folk art style of appliqué and the homespun textured wools that are so characteristic of these designs. So I started making my own penny rug inspired creations using scraps of wool and woolfelt. I love the process of adding layers of appliqué and embellishing them with traditional hand embroidery stitches. I generally work with contrasting thread colors so that you can see the stitches and I feel that my design comes to life once I start adding the colored threads. Of course, my favorite thread is AURIfil Lana, a wonderful wool thread that hand embroiders perfectly and adds lovely texture to my wool designs. 4. Did you have a career prior to making art, and what was it? I came to Paris, France at 19 to study fashion with the intention of going back to my home in Ireland once I had finished my studies and become a fashion designer. Destiny I guess had other plans for me… and I remained in France, started working in airline telecommunications, married a French man and became mother to 3 wonderful boys. I continued to be creative and crafty, sewing, embroidering and home decorating throughout the years. 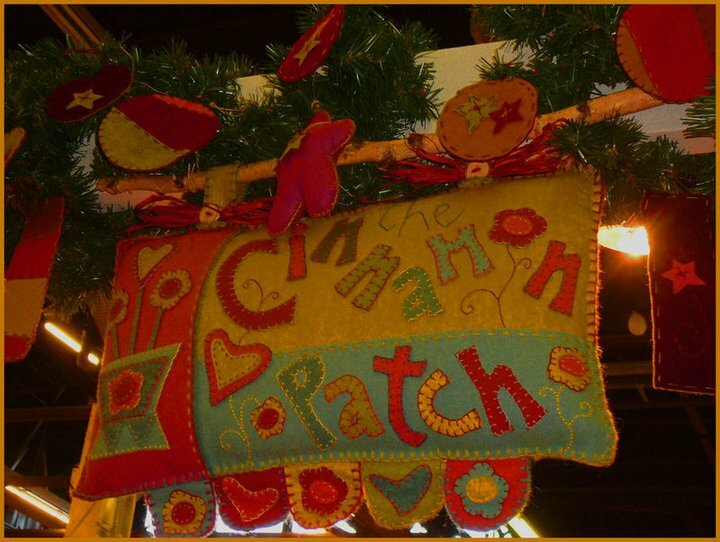 But when the boys were a little older, I had a real yearning to develop my creativity and I launched The Cinnamon Patch as a cottage industry in my kitchen with the intention of working only 3 afternoons a week. The 3 afternoons quickly turned into a very full time job! 5. How do you fill your soul? What I mean by this is – what makes you SO HAPPY that you know that if you do this you are experiencing a little ‘Heaven on Earth’. 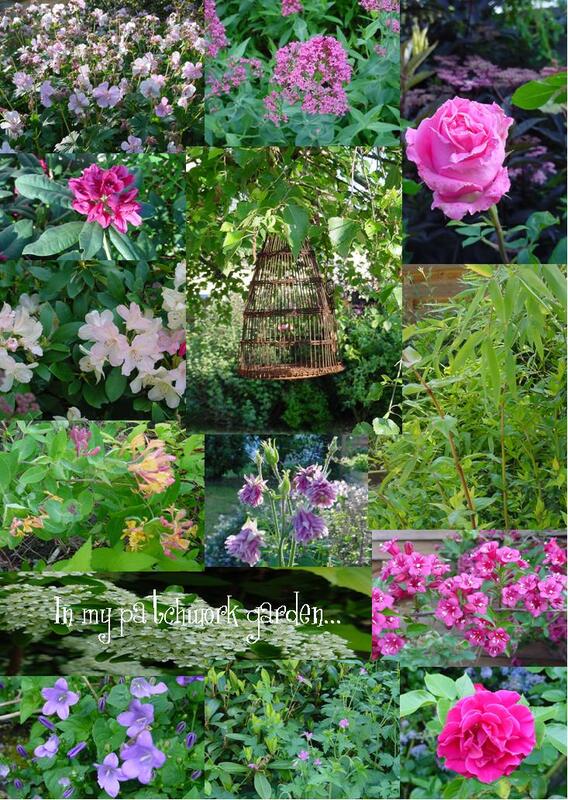 I love gardening, visiting interesting gardens and nurseries, and planning new ideas for my own tiny suburban garden. It is a love that I share with my Mother and one of my sisters, Joy, and we love to challenge each other with our knowledge of the latin botanical names of flowers and shrubs! I think that nature can be so generous and my modest efforts are often greatly rewarded as the seasons go by. Right now (late September) my garden is a flush with magnificent dahlias. However, “Heaven on Earth” is not in the garden but is without a doubt in my Mother’s kitchen in Ireland with a cup of tea and a toasted fruit scone in my hand… yum! yum! Wish I was there right now! 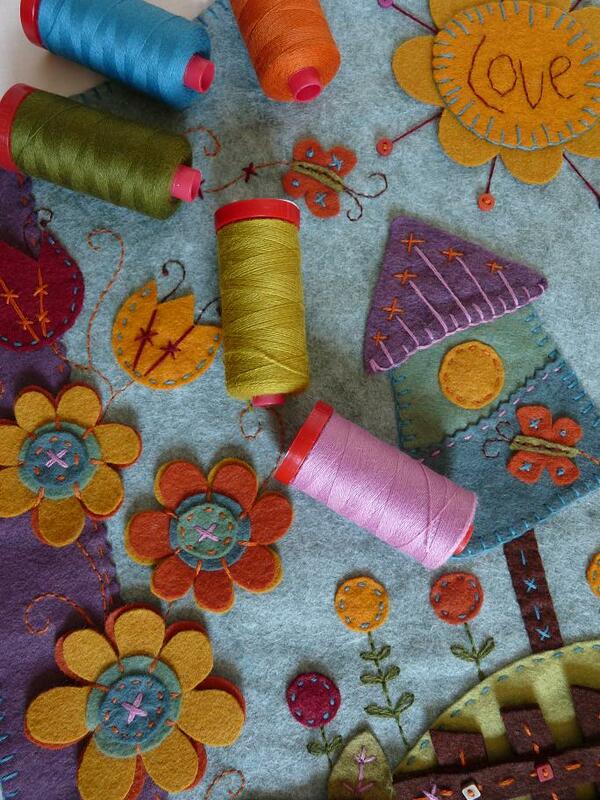 I save all my favourite scraps of fabrics, wools and threads, even the tiniest pieces. I love rooting in my scrap box looking for a small piece to catch my eye. Most of my designs begin with a color idea, quite often inspired by a length of multi-colored embroidery thread or a piece of pattered fabric. 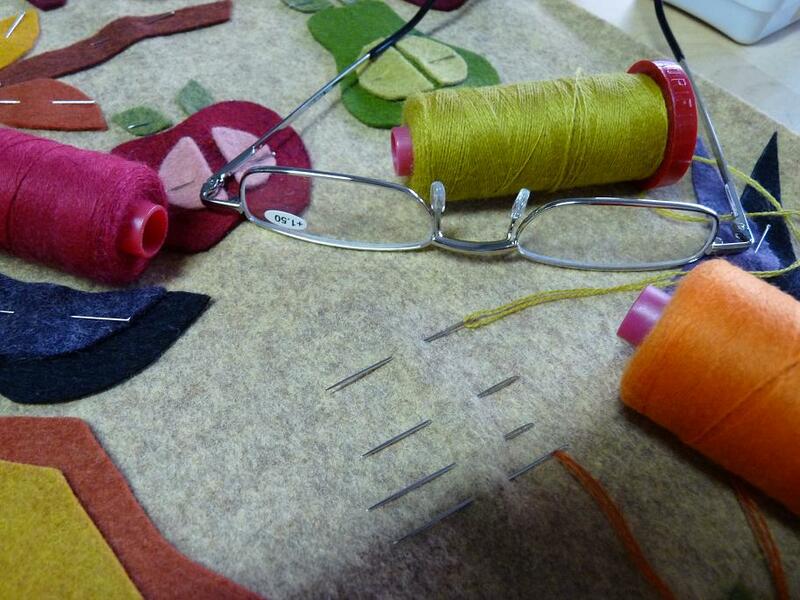 From here I choose my palette of woolfelt colors, mixing plain and heathered textures in the same color range. Then, I add the fabric scraps and threads and I am ready to start cutting. 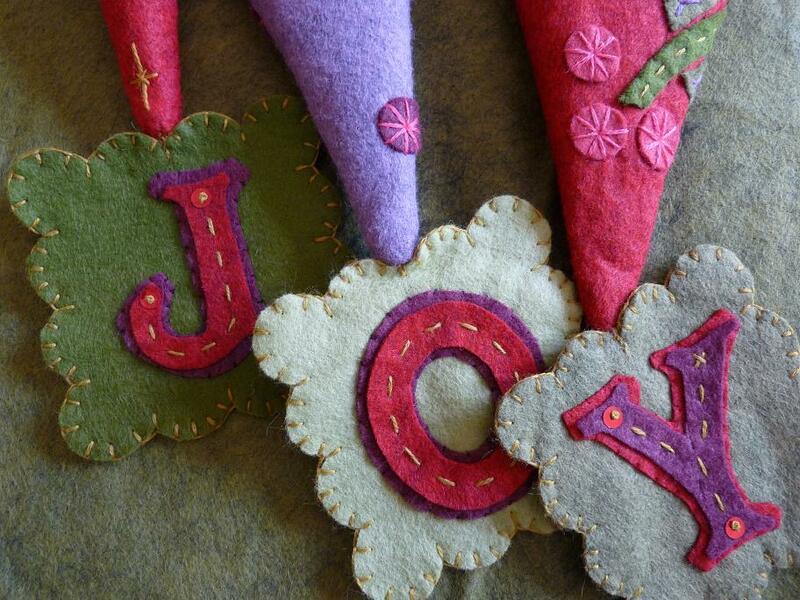 My designs are quick to make and generally have a seasonal theme and with the woolfelt add a touch of warmth and originality to the home. I find Autumn a particularly inspiring season with its rich color palette and earthy tones. 7. What is your favorite weight of Aurifil thread? What are your ‘go to’ thread colors? AURIfil Lana threads of course! It is a wool/acrylic mix in a 12 weight and it is the perfect thread for assembling and embellishing all my wool projects. I use it on the machine when making totes and purses and other home deco items in heavier fabrics. However, I love it most of all for hand embroidery as it adds lots of texture and richness, in particular when I double the thread. My “must have” color is 8920 which is kind of aged bronze that just seems to tone in with every color combination that I work with. 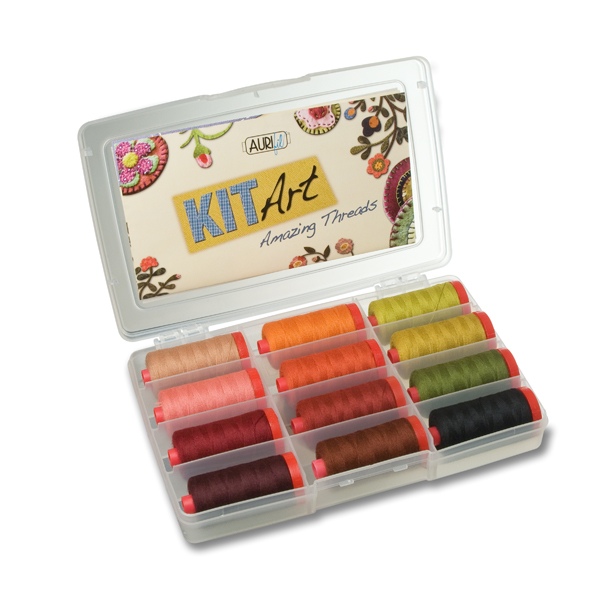 I also have been very lucky to have been invited by AURIfil to choose my 12 favorite colors to put into one of their thread art kits. 8. Besides your sewing machine, what are the tools you MUST have when you quilt? Good lighting and, unfortunately, a pair of reading glasses… I recently woke up one morning to discover that I could no longer thread my lovely Lana into a needle without the help of bi-focals! 9. Do you travel to teach? Yes, I do travel to teach in stores, clubs and at guild retreats, which in France we call “Journée de l’Amitié “ (Friendship day). 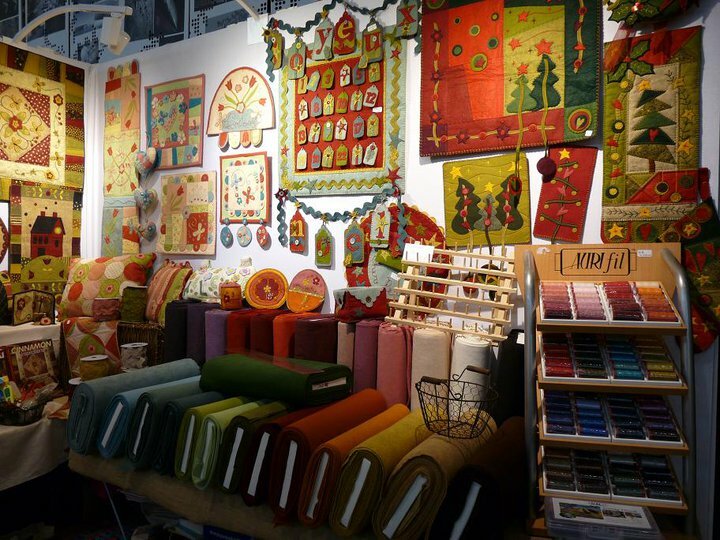 I also exhibit at a lot of retail and wholesale craft, hobby and needlework shows in France and in neighboring countries, such as Germany, Spain, Italy, Belgium and Holland. So I am on the road a lot! 10. How would you describe your personality? Are you process oriented, detailed, big picture, are you carefree, structured, unstructured, all over the place depending on the project? I like to think that I am detail oriented and strive to apply an orderly process to every project I undertake. Invariably, time constraints and deadlines mess up the process so it seems like everything becomes chaotic and last minute, which of course I find frustrating. In addition, I have become a bit of a quilting “social butterfly” and love to connect with other quilters around the world via the internet. And as we all know, socializing takes time… but it’s so much fun! My latest “Victorian Christmas” collection uses lovely National Nonwovens woolfelts in warm rich shades that evoke for me the sweet and spicy fragrances of cinnamon, cranberry and apples, reminiscent of the joyful festivities of a bygone age. To ensure that the templates print out at the correct size, please check on your Print Options page that the Page Scaling option is set at NONE (and not SHRINK TO PRINTABLE AREA). Thank you for the compliments! And I must admit that Lana threads have added an extra dimension to my designs. I just love the color palette! Enjoyed this interview, I don’t work with wool much, but love these examples and the pattern! Merci beaucoup pour le post sur ton blog! I so enjoy Marianne’s creativity. I love everything she makes! I sure wish we could get her to come to the U.S. Thank you Debbie! 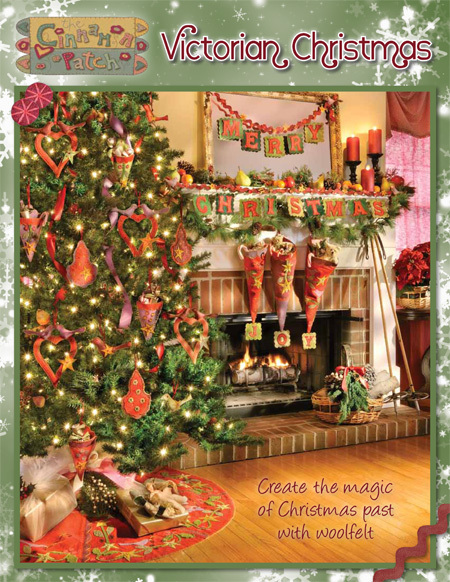 My patterns and books are available from Brewer Sewing if you are a shop owner. Otherwise, you can order from http://www.joggles.com. They seems to stock most of my designs and the woolfelt too. Thank you for sharing Marianne’s work. It is truly inspirational. I love working with wool and have to try these new threads. I think they would add that certain “Je ne sais quoi?” to my work. Hello Michelle, you really must try Aurifil Lana threads! If you like working with wool you will really love these threads. Since I started using them in my designs I have banished all others from sewing box! thanks for the compliments! goodness, this is beautiful, inspiring work! someone just gave a spool of this gorgeous thread- have to try it! You will love Lana threads… believe me! Enjoy Harvest Feast! Beautiful workmanship! Lovely and vibrant colors too! 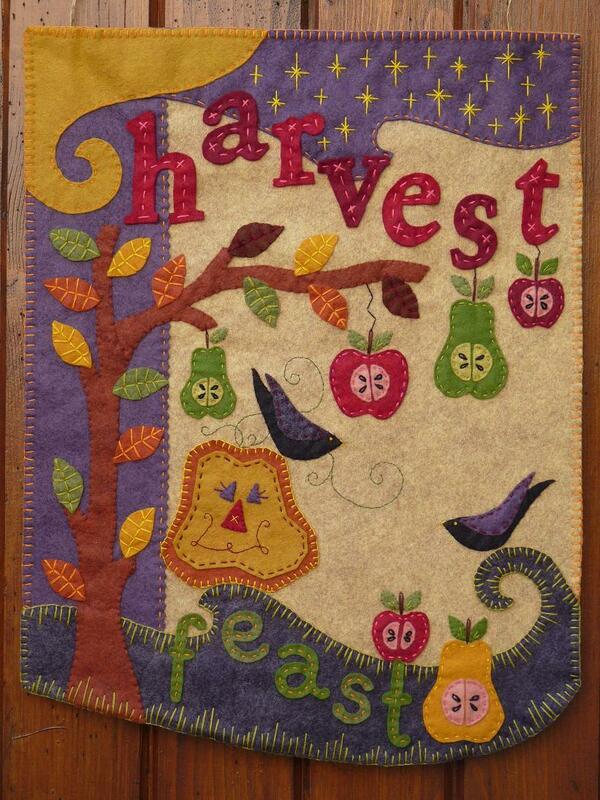 Hope you enjoy making your own version of Harvest Feast… looking forward to seeing it too! Marianne’s work is so very unique. Really awesome post. I just came by your blog and wanted to say that I have truly enjoyed browsing your posts. Any way, I’ll be subscribing to your RSS feed and I’m hoping you post again shortly! hi marianne , what a pleasant surprise pageing through your interview with aurifil, it was indeed an inspiration, what a wonderful selection of colors in the wool felt and aurifil threads.no doubt with such creative talent you bring your designs to life with a really special effect , so proud of you marianne. Thanks Mom! miss you and see you soon! Wow, what beautiful work you do. I have been wanting to work with felt myself. your work gives me inspiration. The aurifil threads are lovely. I would love to purchase and embroider on felt! Thanks Chandice! 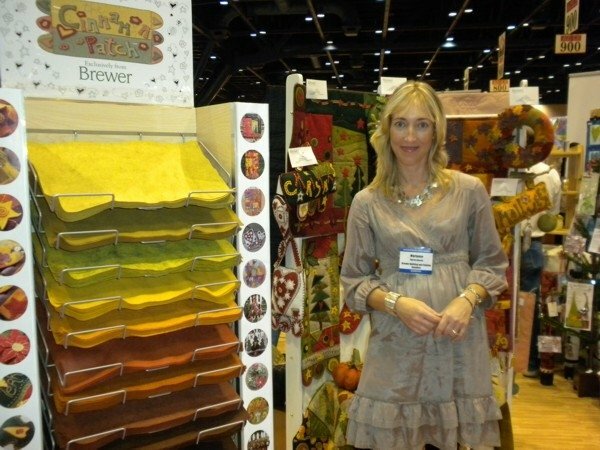 I am sure you will love working with woolfelt. It’s so easy to be creative with it! Wow! I’ve become a new fan. Love your designs. Thank you for the pattern. These are works of art … absolutely gorgeous! I love your designs! I have not worked with wool yet but you have inspired me to try.